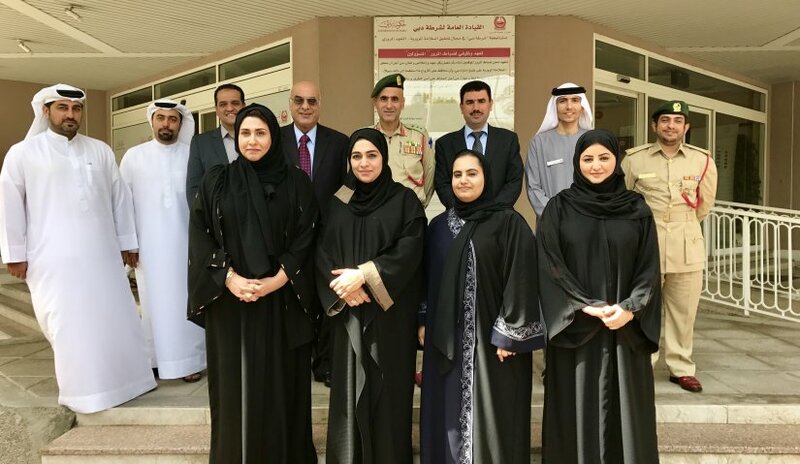 A delegation of faculty members and students visited the General Directorate of Traffic to discuss scientific research carried out by College of Law students entitled "Traffic Safety for Children and the Elderly". The delegation included Prof. Nasr Abbas, Director of Student Affairs Unit, Dr. Ezzat Al Omari from the College of Law and Dr. Ahmed Kamel from the College of Mass Communication with students Amal Al Shamri, Sarah Jassim, Manal Al Shafei, Latifa Al Hajri and Aisha Al Rahoumi. The delegation was met by Colonel Jamal Mohammed Al-Bannai, Deputy Director of the General Directorate of Traffic and Dr. Mustafa Khader Aldah, Senior Researcher in the General Directorate of Traffic. Al Falah University aims to encourage students to improve their scientific abilities and stimulate their creative thinking in a way that contributes to improving the level of educational achievement.